One of Love-A-Bull’s fosters and volunteers came across two dogs running loose in a field outside of her neighborhood. It was apparent both had been into some trouble as both were bleeding and had open wounds. The volunteer was able to catch the dogs and get them safely to Austin Animal Center to be examined and held safely. In the coming days Love-A-Bull was approached to bring in one of the dogs to our foster network, as it was a pit bull type dog. After sending out a trainer to evaluate the dog we would soon come to know as Peaches, we pulled her into the Love-A-Bull Foster Network. Peaches received a great foster home where she was able to begin working on basic commands and manners. Her foster mom noticed immediately that Peaches had HUGE ball drive! This meant that she could be a potential candidate for the working dog program, Detect-A-Bull, held at the Canine Training Academy. Unfortunately, before moving forward with having Peaches assessed at the Canine Training Academy, she needed to get through her heartworm treatment. Heartworm treatment can be physically draining on dogs and requires 6-8 weeks of crate rest. However, Peaches foster mom and the Love-A-Bull team made sure that she came out of her treatment with no ill side effects. Peaches was just as peppy as ever when she was finally able to run around and chase balls again! Soon after Peaches completed her heartworm treatment, one of Love-A-Bull’s trainers was able to connect Love-A-Bull with the Canine Training Academy once again. Love-A-Bull successfully placed former adopt-a-bull, Maxine into their training program two years prior. 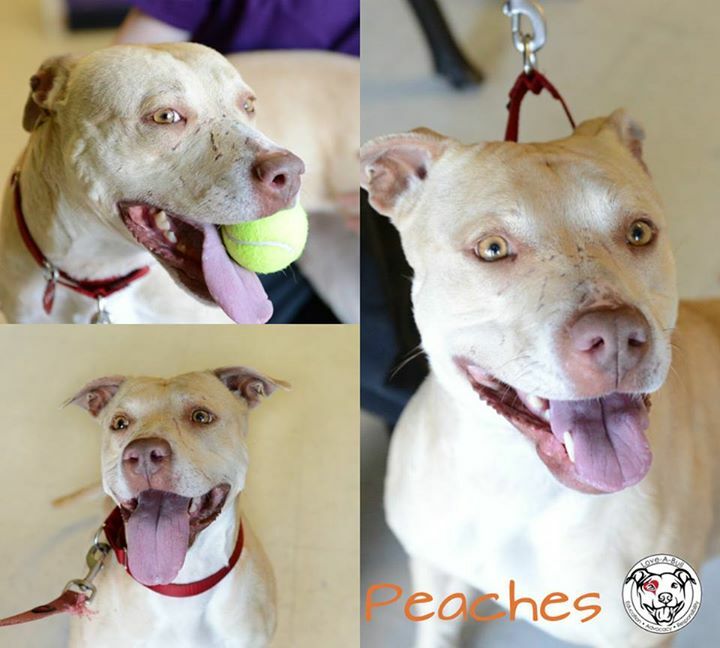 Peaches was evaluated in several areas that would confirm that she would be a perfect candidate for the Detect-A-Bull program! 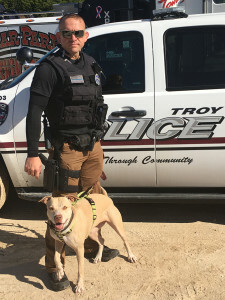 Peaches completed her K9 training with flying colors and she and her handler, Officer Jeff Mullenax, have now formed the City of Troy’s first official K9 unit. Peaches is a narcotics detection dog and her first traffic stop resulted in a hit on crystal meth! Peaches is made to do this work and she will be so happy having her high energy, ball drive, and nose work skills put to use for the rest of her life! 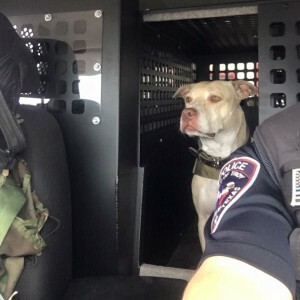 We are so incredibly excited for the future of this once stray pup and all the amazing things she is going to help the City of Troy’s police department accomplish. 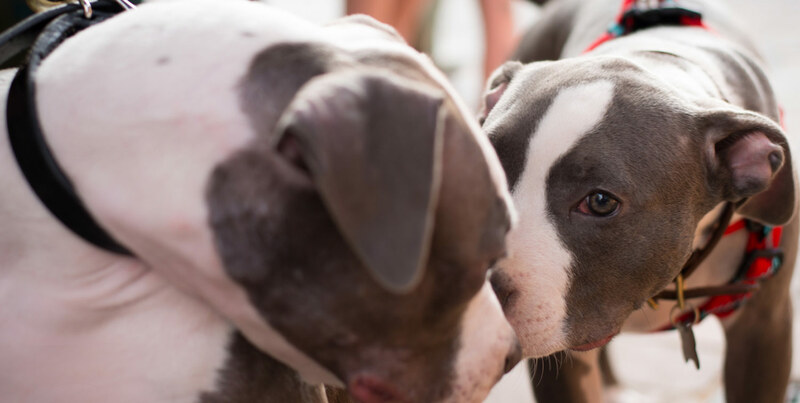 ← *Rescheduled*–Love-A-Bull’s 7th Annual National Pit Bull Awareness Day Celebration! !